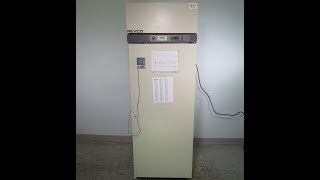 The Thermo Fisher Revco -20 Freezer is built for the storage of commonly used lab materials, as well as reagents pharmaceuticals and biologicals. The temperature range of this laboratory freezer is set at -20°C with a manual defrost, and cold wall convection cooling for terrific uniformity and stability without a blower fan. This 23.3 cu ft lab freezer is filled with 2 in thick, high density CFC free urethane foam insulation, sandwiched between sturdy cold rolled steel that’s resistant to scratches. The door to this upright freezer is self-closing but will hold open at 90 degrees, has a full length handle for easy opening and a lock for added security. The Thermo Revco -20 Freezer is microprocessor controlled with a large easy to ready digital display, and a graphic thermometer that does double duty as a visual alarm in the event of temperature fluctuations. Operations are also key operated and lockable to prevent accidental tampering. This Thermo Revco -20 Freezer has never been used and comes with current validation reports. This unit is a scratch and dent model. All of our lab equipment comes backed with our standard warranty. Should you have any questions, please don't hesitate to contact us.